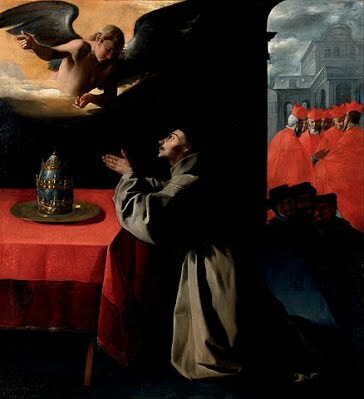 July 15 - Saint Bonaventure, Bishop and Doctor - Memorial - My Catholic Life! The scholarly heft of Saint Bonaventure legitimized the eccentric Saint Francis of Assisi. Saint Bonaventure was to the Franciscans what Thomas Aquinas was to the Dominicans. These contemporaries form twin summits of scholastic thought, first rate intellectuals whose eminent writings lent their young, revolutionary, religious orders credibility. Aquinas and Bonaventure received their doctorates on the very same day, and are shown as equals in Raphael’s Disputation of the Holy Sacrament. Both Thomas and Bonaventure were also pious, poor, humble, and holy, giving their theological work even greater weight. Saint Bonaventure was part of that huge influx of second generation Franciscans who never knew their founder. He joined the order in 1243, received his doctorate in theology from University of Paris, and became master of the Franciscan school at Paris in 1253. In 1257 he was elected minister general of the entire Franciscan order. He was just thirty six years old. The pressing responsibilities of religious leadership constrained Bonaventure from total dedication to the life of the mind. He had limited time to read, write, and do research once he was elected head of his order, making the first half of his life his most prolific period of scholarship. But that scholarship was so comprehensive as to be a complete system of thought. He wrote on everything – fundamental theology, the nature of dogma, Scripture and history, the gifts of the Holy Spirit, angels, creation, the virtues – and all of it was suffused with a mature spirituality focused on the individual soul progressing towards God. With this intensely spiritual focus, Bonaventure is said to be more Augustinian in his theology than Aquinas, who is more Aristotelian. The former’s goal was to love, the latter’s to speculate and to know. Bonaventure’s writings on dogma were influential at the Council of Trent and continue to be read. Bonaventure led his order in a period of sharp tension among Franciscans over the legacy of Saint Francis. Should the order own property directly or just use property owned by others? Should the brothers be educated and teach, or remain simple and only preach? Should the brothers live in the growing cities of the medieval world or stay in the country, like Francis himself? Should the brothers in northern Europe be allowed to wear shoes, or must they go barefoot like Saint Francis commanded? These, and many other, questions cleaved the body Franciscan. Many of the diverse interpretations of Francis’ legacy were unresolvable, and in the early sixteenth century the order morphed into three entities, each embodying a particular spiritual emphasis. Saint Bonaventure, you had few equals in knowledge, love, prayer, and virtue. Through your heavenly intercession, help all Catholics to progress towards union with God by the many paths you yourself walked so before us. SANCTITY and learning raised Bonaventure to the Church’s highest honors, and from a child he was the companion of Saints. Yet at heart he was ever the poor Franciscan friar, and practised and taught humility and mortification. St. Francis gave him his name; for, having miraculously cured him of a mortal sickness, he prophetically exclaimed of the child, “O bona ventura!”—good luck. He is known also as the “Seraphic Doctor,” from the fervor of divine love which breathes in his writings. He was the friend of St. Thomas Aquinas, who asked him one day whence he drew his great learning. He replied by pointing to his crucifix. At another time St. Thomas found him in ecstasy while writing the life of St. Francis, and exclaimed, “Let us leave a Saint to write of a Saint.” They received the Doctor’s cap together. He was the guest and adviser of St. Louis, and the director of St. Isabella, the king’s sister. At the age of thirty-five he was made general of his Order; and only escaped another dignity, the Archbishopric of York, by dint of tears and entreaties. Gregory X. appointed him Cardinal Bishop of Albano. When the Saint heard of the Pope’s resolve to create him a Cardinal, he quietly made his escape from Italy. But Gregory sent him a summons to return to Rome. On his way, he stopped to rest himself at a convent of his Order near Florence; and there two Papal messengers, sent to meet him with the Cardinal’s hat, found him washing the dishes. The Saint desired them to hang the hat on a bush that was near, and take a walk in the garden until he had finished what he was about. Then taking up the hat with unfeigned sorrow, he joined the messengers, and paid them the respect due to their character. He sat at the Pontiff’s right hand, and spoke first at the Council of Lyons. His piety and eloquence won over the Greeks to Catholic union, and then his strength failed. He died while the Council was sitting, and was buried by the assembled bishops, A. D. 1274.